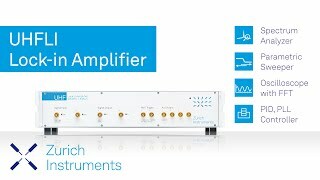 The Zurich Instruments UHFLI is a digital lock-in amplifier covering the frequency range from DC to 600 MHz. In addition of providing the highest operation frequency amongst all commercial lock-in amplifiers, the UHFLI also offers the lowest time constant of 30 ns for demodulation, resulting in a demodulation bandwidth of more than 5 MHz. The exquisite analog front end offers a spectacular noise performance of 4 nV/√Hz which helps in many applications to keep the signal-to-noise ratios high while speeding up the measurement. In combination with the most innovative instrument control software LabOne®, the UHFLI is the flagship of all Zurich Instruments products and represents the state of the art of today's scientific instrumentation. The AM/FM modulation option allows to generate phase-coherent linear combinations of up to 3 oscillator frequencies. The direct measurement of (higher-order) sidebands in a variety of different modulation schemes, including amplitude modulation (AM) and frequency modulation (FM), can be conveniently set up. Unlike conventional double demodulation schemes, e.g. tandem demodulation, the user will not need multiple instruments and is also not limited in modulation frequencies by the maximum available demodulation bandwidth. The UHF-PID option consists of 4 configurable PID (proportional - integral - derivative) controllers. Based on a variety of different measurement data they can provide fast feedback to a number of instrument parameters and output values. Seamlessly integrated with the lock-in amplifier, the programmable PIDs enable operation in a wide range of applications such as the setup of PLLs (phase-locked loops) for phase synchronization of two lasers, CEO stabilization and fast AFM modes. The UHF-BOX Boxcar Averager is the first fully digital boxcar averager in history opening new perspectives and innovative ways of analyzing non-sinusodial signals with low duty cycles. It operates as a high speed digitizer synchronized to an oscillator and therefore captures every sample without any dead times while rejecting all non-periodic signal components. The UHF-RUB upgrade option provides an atomic frequency standard to the UHFLI instrument. Experiments in need of a high frequency accuracy and stable operation over long periods of time even in adverse conditions, e.g. laboratories with limited climate-control, can rely on the Rubidium based atomic clock. Moreover, calibration demands are also further reduced as there is essentially no clock aging. The UHF-RUB is a hardware option that cannot be upgraded later in the field. The UHF-CNT Pulse Counter features analysis of up to 4 pulse trains in parallel, enabling event based measurements, e.g. photon detection using photo-multiplier tubes. 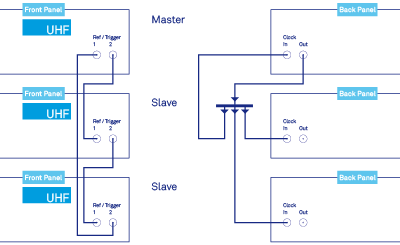 There are five distinct modes of operation and each channel offers an adjustable discriminator. The maximum count rate is 225 MHz. Measurement results from the pulse counters can be conveniently analyzed with the LabOne® toolset, which features time domain and histogram display. The UHF Boxcar is a bundle containing the UHFLI 600 MHz lock-in amplifier and the UHF-BOX Boxcar upgrade option. The 2 Signal Inputs and 2 Signal Outputs effectively provide 2 lock-in amplifiers in one instrument. Each lock-in amplifier unit comprises 4 dual-phase demodulators which simultaneously provide X, Y, R and Θ. The 2 signal inputs of the UHFLI provide excellent noise specifications and operate in single-ended mode. Input coupling is selectable between high impedance and 50 Ω, suiting both low-frequency and high-speed applications. For external reference mode and precise triggering on external events, the UHFLI comes with additional 2 input and 2 bidirectional connectors. Dual internal and dual-auto reference modes are also supported. The UHFLI generates 2 low-distortion sinusoid outputs ideal for driving the device under test or most modulating devices. The UHF-MF Multi-frequency option provides 6 additional oscillators and enables the generation of a linear combination of up to 8 sinusoids. Additional connectors on the front panel provide the demodulated amplitude, phase, or quadrature signals, square wave references, or trigger signals for external hardware. The UHFLI comes with 8 dual-phase demodulators for simultaneous measurement at 4 harmonic frequencies per signal input. Each demodulator has individually configurable filter parameters. The measured amplitude and phase data after demodulation are streamed in real-time to the host computer. A reference and trigger network provides high-performance operation: reference input and output work at a bandwidth of 600 MHz, trigger input and output feature reaction times down to 100 ns. The UHFLI is the first lock-in amplifier with dedicated hardware and software trigger functionalities. Hardware triggers enable quick reaction to physical conditions, whereas software triggers provide an infrastructure to define complex trigger criteria. Triggers are used to output demodulated samples at specific points in time, or to synchronize actions between several functional domains inside the UHFLI. The Arithmetic Unit enables fast computation on a multitude of measurement data. This processor features addition, subtraction, multiplication and division of all data that are available on the auxiliary outputs. Applications include balanced detection, normalization by a reference, or dual-frequency resonance tracking.